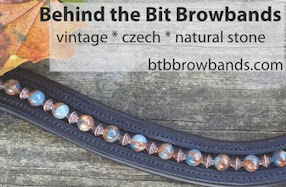 Behind the Bit: REMARKable: Brindle thoroughbred racing now! REMARKable: Brindle thoroughbred racing now! 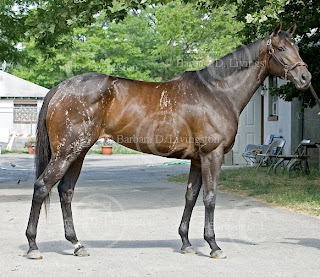 Her name is Remark and she's by Distorted Humor. I think she broke her maiden at Saratoga, and her record is 8 starts, 1 win, 3 seconds, and 2 thirds. She's an exceedingly well-bred filly (see pedigree) and looks it. Interestingly all of her markings on on one side only--the right side. It almost looks as if someone spilled bleach on her. What curious markings. That's really cool. I've always had a fascination with brindles-perhaps it's their rarity or maybe just because of their beauty. Either way, thanks for sharing this! She's stunning! Looks like someone spilled some bleach over her back! She almost looks as if someone spilled bleach on her. What unusual markings. Might be fun to see the description on her papers as the Jockey Association does require markings to be listed. Do they know if she's a chimera? Females have two X chromosomes, which carry several coat color genes each. Sometime after the early embryos is formed, one X chromosome in each cell is shut down, so only the coat color gene from the still-active chromosome can drive coat color expression in those cells. These cells go on and divide and make more cells with the same X inactivation pattern, so you get clonal "patches" (or in this case stripes) of cells with the same color next to clonal patches with a different color. If the X-inactivation event occurred after this embryo already formed a left-right body axis, this would explain why this horse only has brindling on one side. It also explains why you only ever see these kinds of coat patterns in females (calico cats, e.g., and brindling at least in some species) - males don't have a second X chromosome to inactivate so every cell expresses the coat color gene on their single X chromosome. PS - I think this is my first comment here but I've been reading this blog for a long time- I just love your writing and your lovely Riley - keep up the good work! She's gorgeous! I ADORE her head and conformation. I just want to drool. lol. And her markings... so strange and so beautiful!